ST. JOHN, NB – As first reported earlier this month, Moosehead Breweries have been developing a new flavoured light lager to complement their Moosehead Light Lime brand. The flavour was initially kept under wraps, but last week it was announced that the beer would be Moose Light Blackberry. In addition to developing the beer and related branding and packaging at a much faster than usual pace, Moosehead’s Director of Marketing Ray Gracewood has been revealing the behind-the-scenes processes and details of the creation of the brand on the brewery blog, Moose Calls. 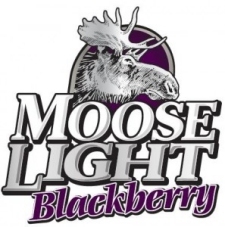 Moose Light Blackberry will be released later this week, with distribution initially limited to New Brunswick and Prince Edward Island, where it is planned to be available until September. Hi! Just wanted to let you’s know that I have tried this new blackberry light and I think it is totally awesome it is nice and smooth and the blackberry flavor really compliments the overall taste. YES! I will purchase it again. Brought some home from a PEI vacation recently. Great stuff, they have to get it into Ontario quick though or some big beer giant will beat them to an untapped market. Same with Pumphouse Blueberry, you guys have to get into Ontario!